France's opposition Republican party has chosen a blunt-speaking young right-winger to be its new leader and start the fight back against President Emmanuel Macron. 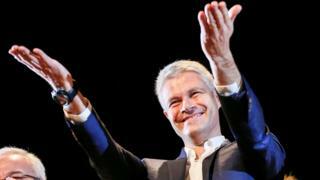 Laurent Wauquiez, a former Europe minister under Nicolas Sarkozy and currently president of the Auvergne-Rhone-Alpes region, was chosen in an internal ballot of party members on Sunday. In the first of two planned rounds of voting, he won the support of nearly 75% of the 100,000 people who took part, easily beating his two rivals. Because he won more than half the vote, there will be no recourse to a second round. The Republican party, which under different names has long been one of the two major forces in French politics, is in pieces following defeats in this year's presidential and parliamentary elections. The previous generation of leaders - Nicolas Sarkozy, Francois Fillon and Alain Juppé - lost credibility after the fiasco of their presidential campaign, which for the first time in modern times saw the centre-right eliminated from round two of the vote. And in the National Assembly, the Republicans are reduced to a rump of fewer than a hundred deputies. Several leading figures defected to President Macron's government, including Prime Minister Edouard Philippe and Economy Minister Bruno Le Maire. Another group of nine former Republican deputies has founded a new party, called Agir, which also supports the government. Mr Wauquiez, 42, has promised to turn the Republicans back into a credible force by reclaiming the right-wing values which he says have been steadily abandoned by his predecessors. "The right has to be quite clear that it is on the right!" he said in a recent interview with Le Figaro newspaper. "By dint of telling everyone what they want to hear, the right has lost its soul - with the result that the French no longer really know what it stands for." On a number of policies, Mr Wauquiez has taken positions which put him clearly at odds with centrists within the party. He is strongly hostile to a federal Europe. He voted against gay marriage. He says welfare dependency is a scourge, and he uses strong language to decry uncontrolled immigration and the "Islamisation" of France. Critics say this shows he wants to form a pact with the far-right National Front (FN), or at least to lure over its supporters. He says he is merely responding to the expectations of ordinary people, and would never ally with FN leader Marine Le Pen. In depth: Who is Marine Le Pen? Born into a well-to-do family of northern industrialists (there is a Wauquiez brand of sailing boat) and educated in Paris, Mr Wauquiez made his home in the mountainous Auvergne region west of Lyon when he entered politics in 2004. Earlier he had a reputation as a high-flyer through a series of elite training institutions, culminating in the National Administration School, ENA. Profiles of Mr Wauquiez unanimously portray him as a man of exceeding ambition. An article in Le Monde in 2015 described the then rising star as the "bad boy of the right". According to many commentators, he made himself enemies inside the Republicans thanks to his naked pursuit of advancement. Others have criticised him for changing policies to suit his career. They say he began as a pro-European "social" conservative, but toughened his language when it was clear the far-right was gaining ground. He says he is not anti-European but believes the current EU system is a failure; that the existing French welfare system encourages dependency and needs to be re-thought; and that France needs to be tougher in defending its identity and institutions. In an editorial following his election, Le Monde said Mr Wauquiez now had "uncontested legitimacy". However it warned that the hard task was now to come, as the new party leader tries to forge a consensus between the "open" and "closed" wings of his party.